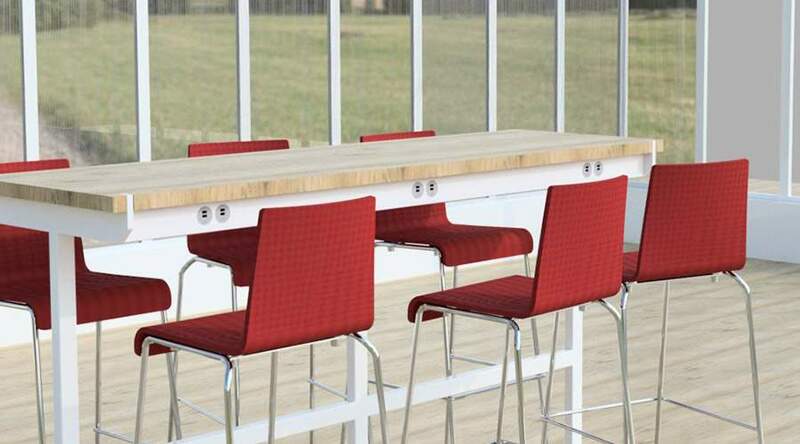 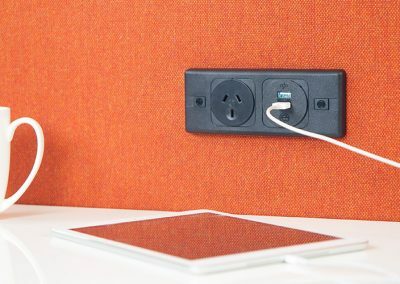 PUMA is designed for panels, whether the panel is a desk screen, modesty panel or even the side of an arm chair, PUMA is your perfect solution for providing convenient but discrete power and data outlets and is now approved for North America. 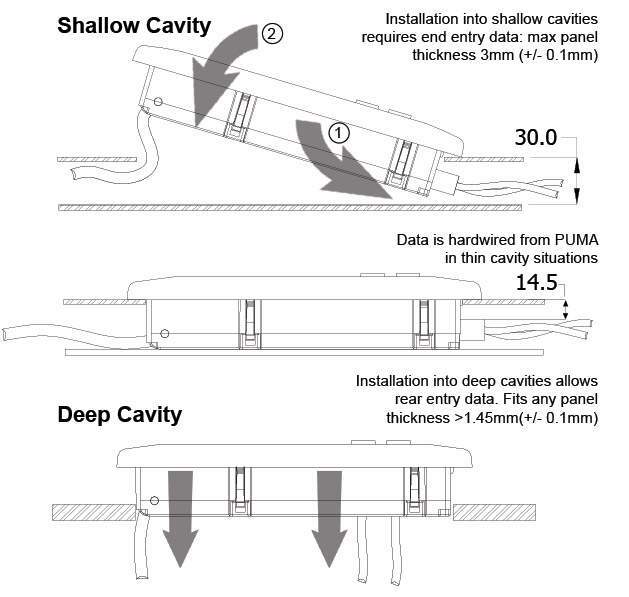 Available in 2 and 3 gang versions and in grey or black, the ultra-compact all polycarbonate PUMA with its side cable entry, easily clips or screws into cavities as little as 30mm deep. 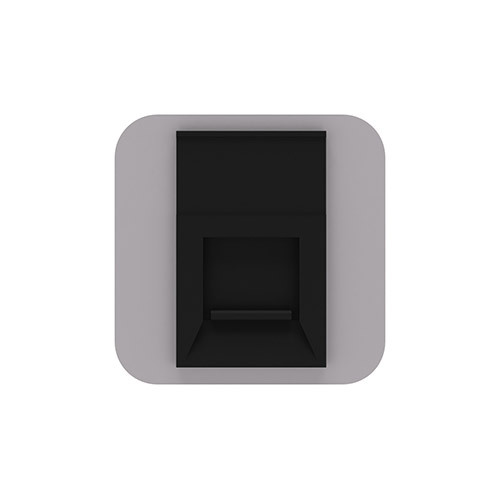 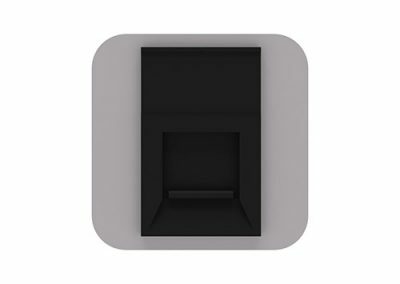 PUMA is also suitable for special applications such as mounting behind metal panels and into other custom enclosures. 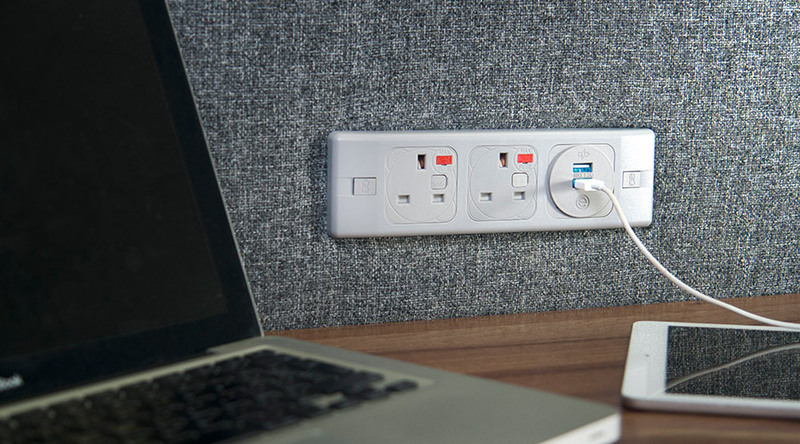 PUMA can be specified with a wide range of international power sockets plus our class leading OE TUFA+C25W:Twin USB Fast charger. 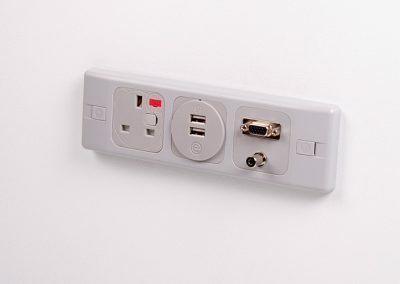 UK sockets incorporate fuses as standard with colour coded fuse rating indicators, with unfused UK sockets also available where their use is more applicable. 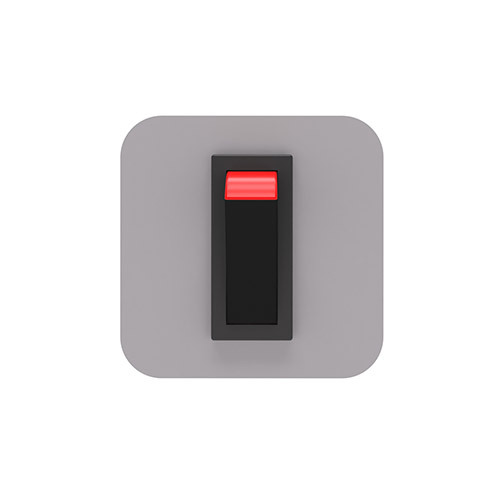 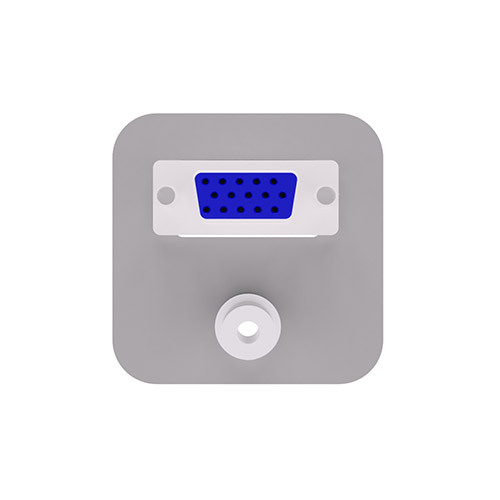 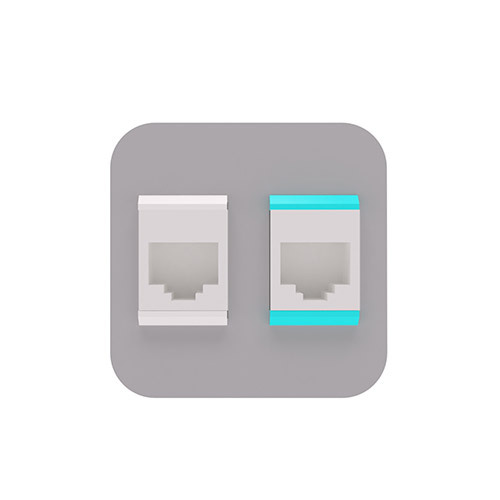 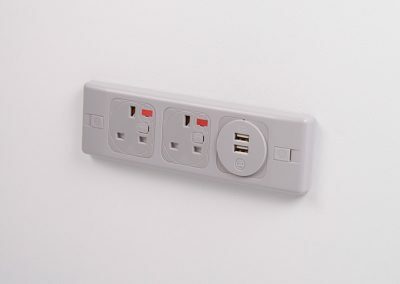 PUMA socket apertures may be configured with the following AC power options from the OE modular range or our class leading OE TUFA+C25W:Twin USB Fast charger and most types/makes of Data/AV. 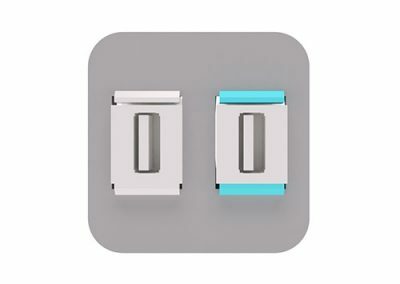 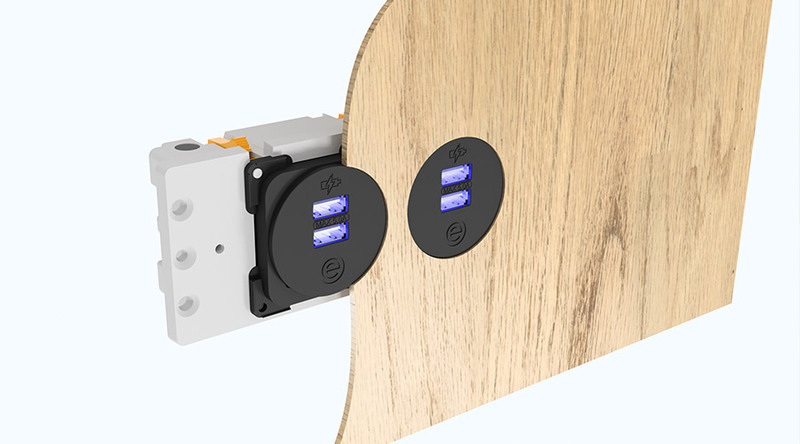 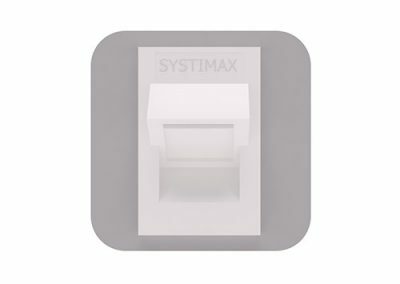 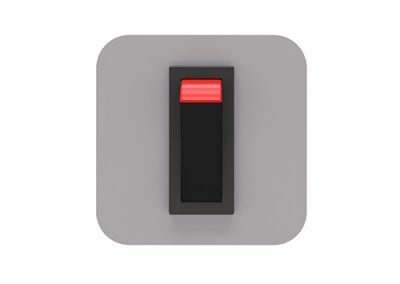 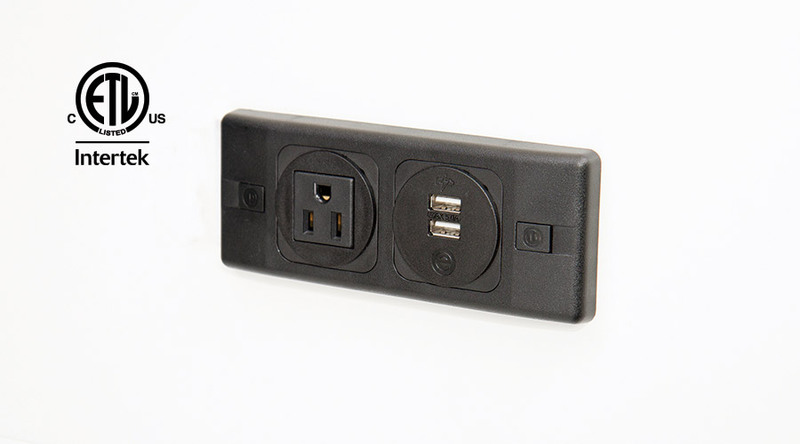 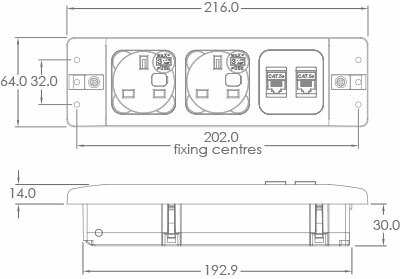 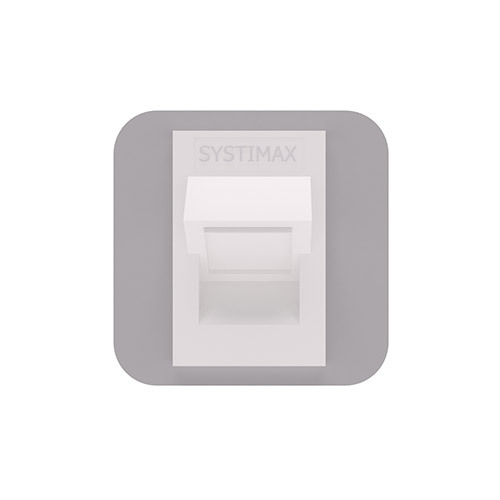 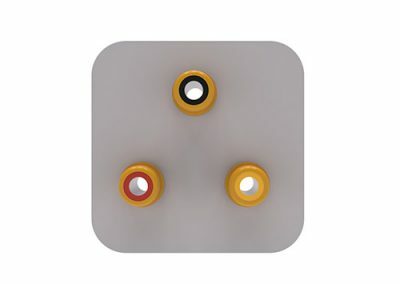 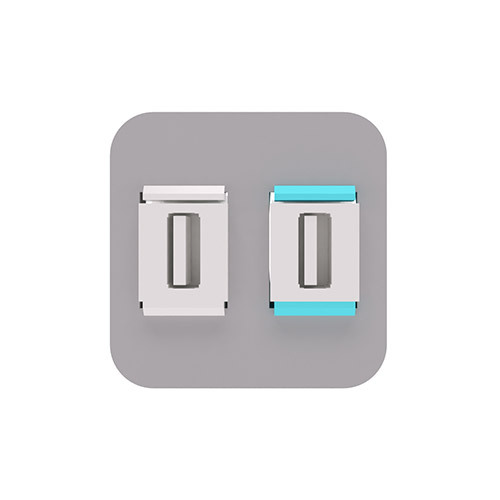 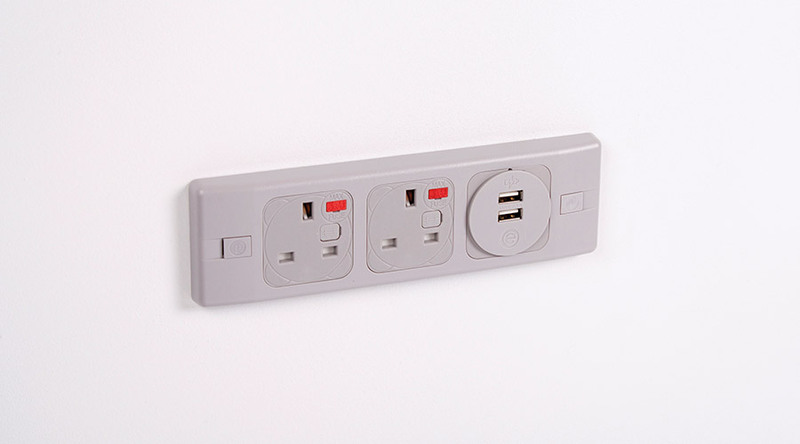 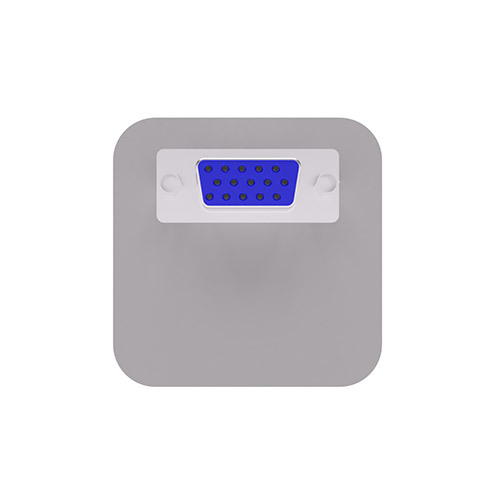 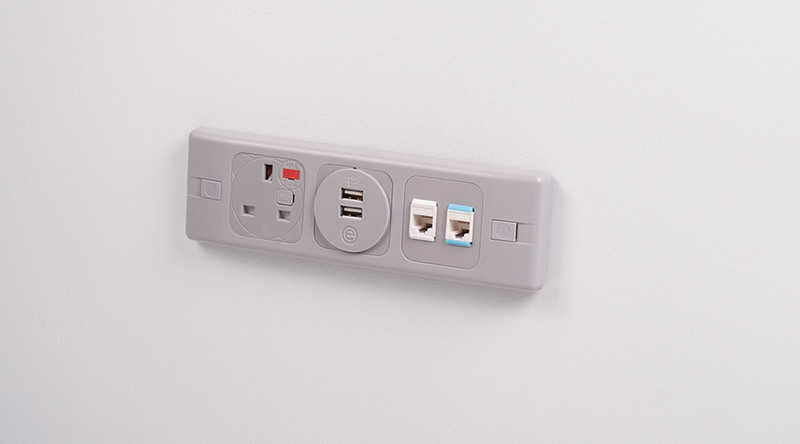 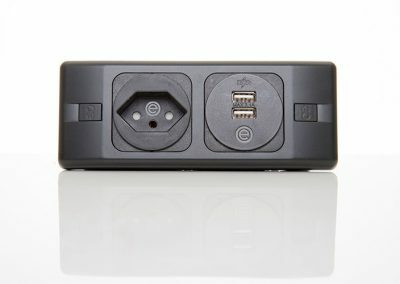 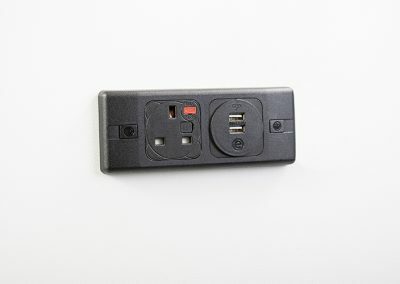 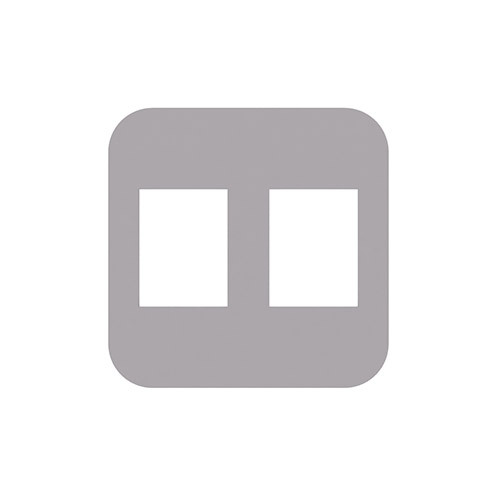 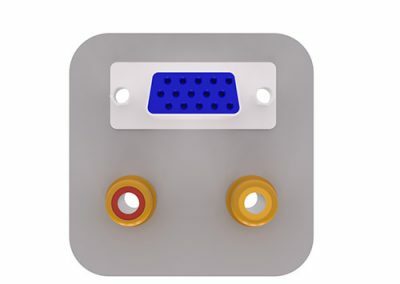 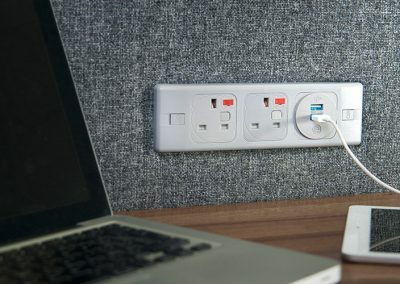 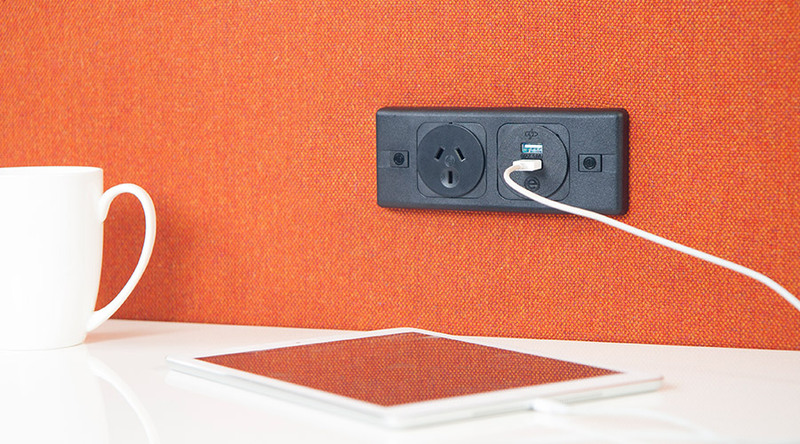 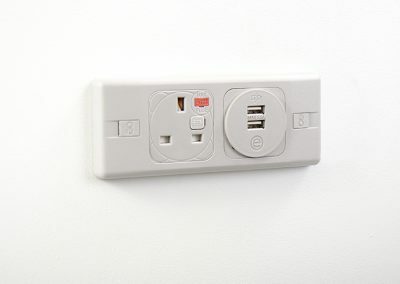 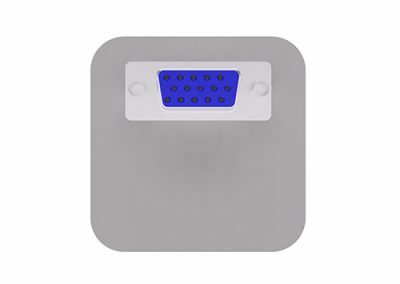 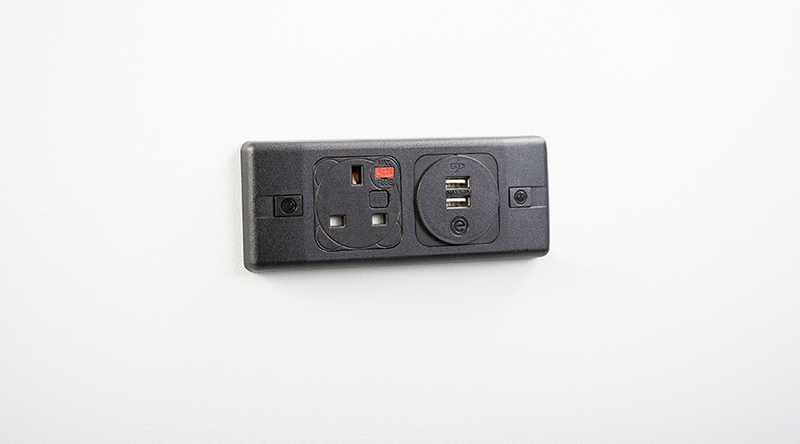 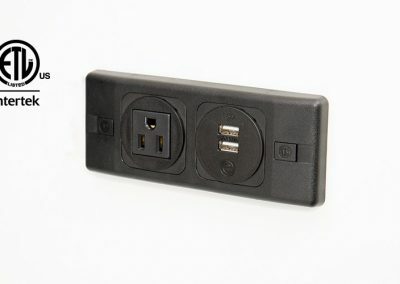 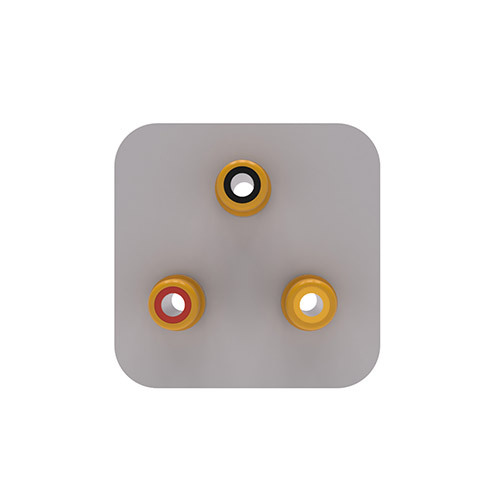 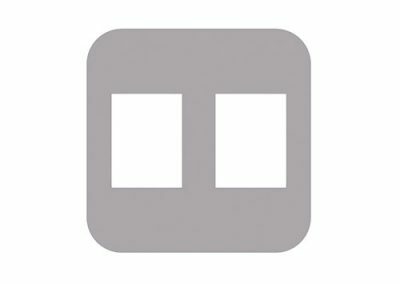 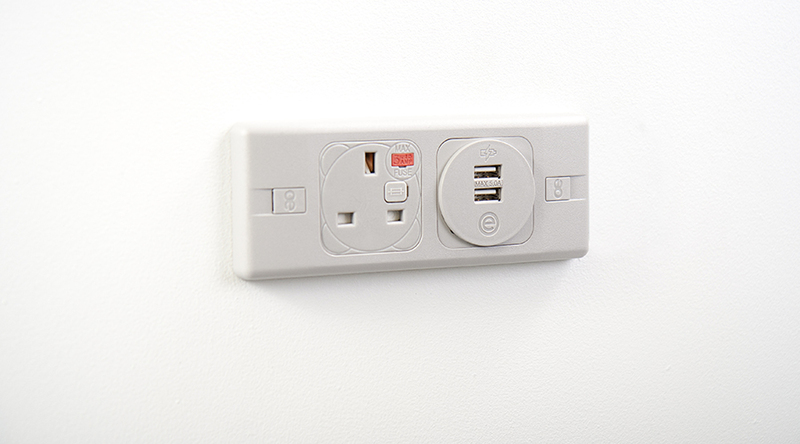 Power: UK, European and International power sockets and/or OE TUFA+C25W:Twin USB Fast charger Data : Cat5e, cat6 Cat6a or Cat7 data connection options, with colour coded port identification. 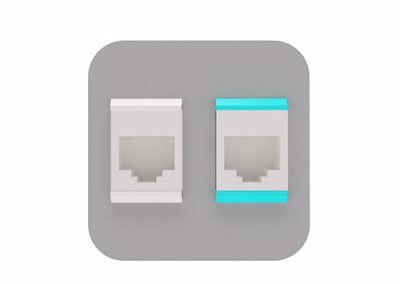 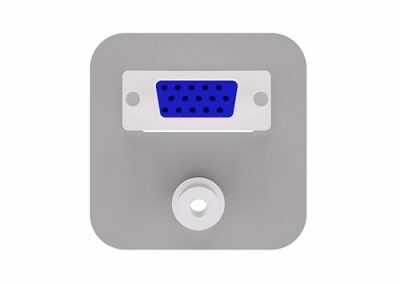 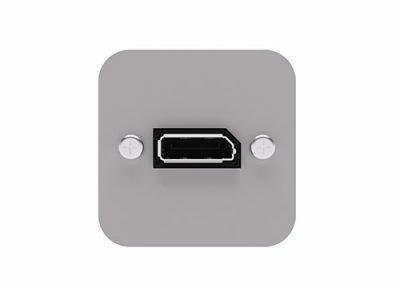 USB: USB2.0 or USB 3.0 type A for PC connection. 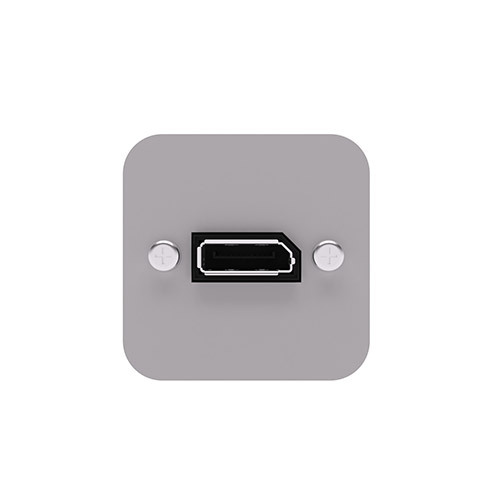 For USB charging specify the OE TUFA+C25W:Twin USB Fast charger AV: VGA, HDMI, DVI-D and Display Port AV connection options. 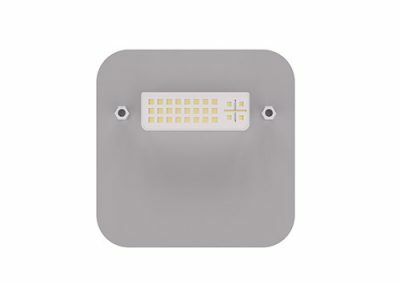 PUMA is moulded in high impact fire retardant polycarbonate, Internal segregation is provided between Power and Data/AV components. 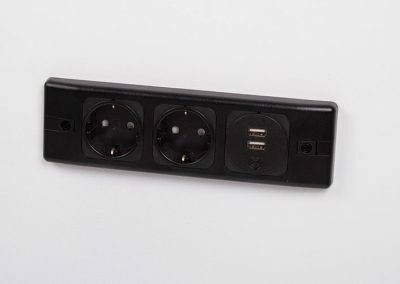 Main body – grey or black Socket frame – grey or black Socket fascia – grey or black (Nema 5-15R – black only) Cable – white (not 14AWG) or black. 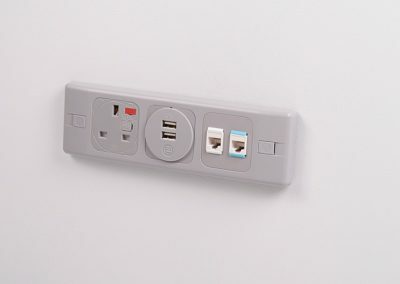 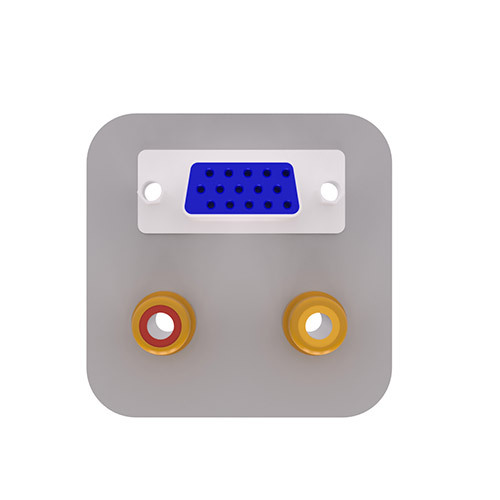 To facilitate compliance with BS6396 UK sockets are fitted with 5 x 20mm anti-surge ceramic fuses, with colour-coded fuse clips to denote the rating (3.15A/5A). 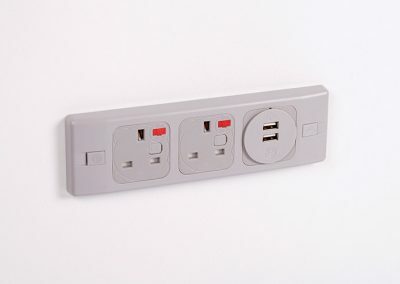 Unfused UK sockets are also available. 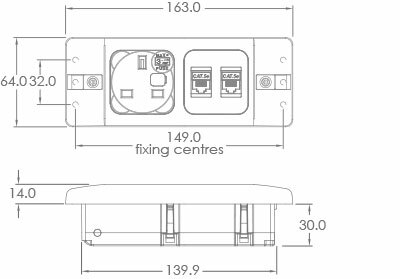 UK socket PUMA modules are supplied as standard with a 250mm earth lead with 5mm ring terminal to enable compliance with BS6396. 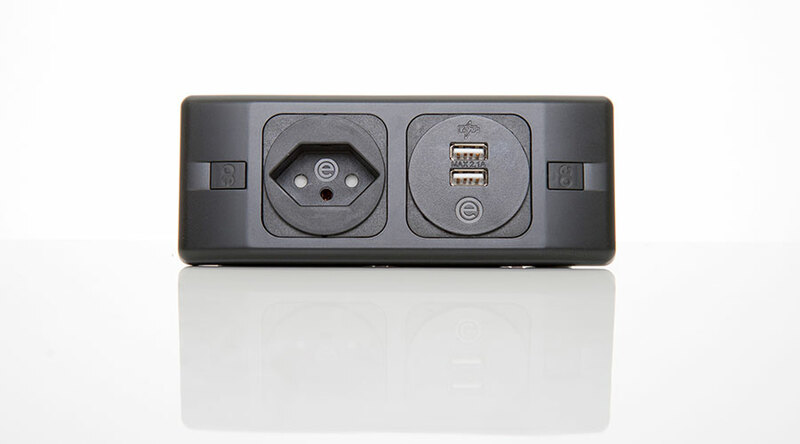 PUMA may be hardwired to: – mains AC plug, – Male Wieland GST18 connector In addition ,PUMA unit can be fitted with a GST female power out connector and multiple PUMA units can be connected to a single power cord using the OE J Coupler. 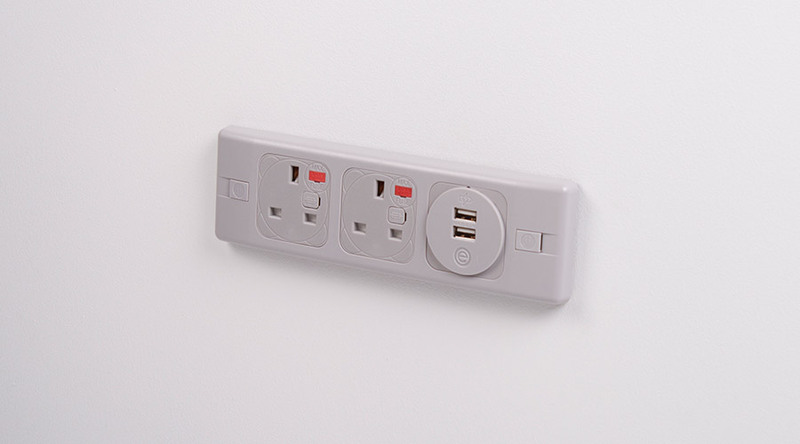 PUMA is fitted with four integral clips for push fit fixing into suitable 1.5mm or 3mm panels. 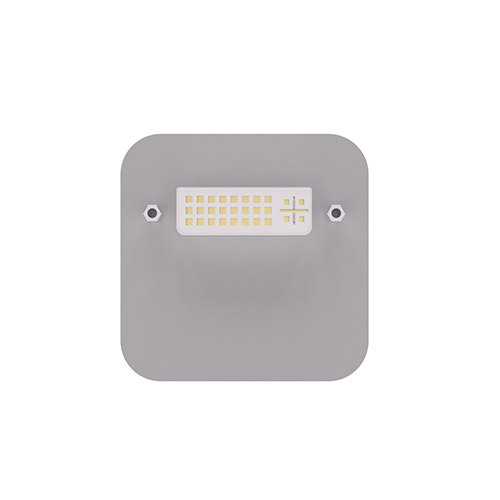 Alternatively ,PUMA can be screw fixed using M4 or M5 screws. 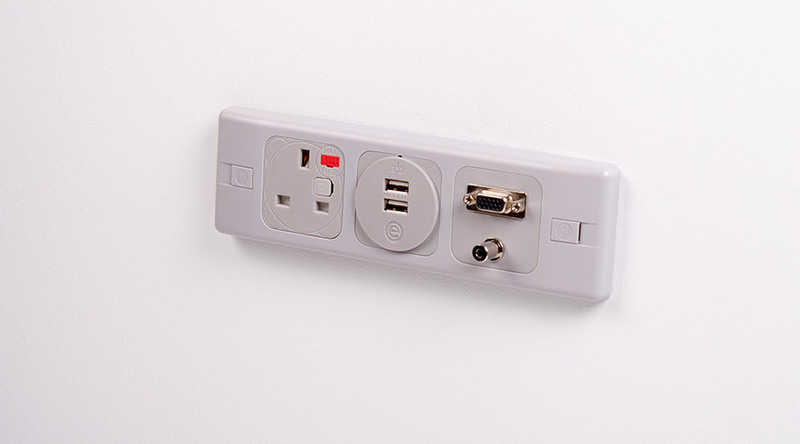 All PUMA units are manufactured using ISO9001 quality controlled components and practices and are 100% tested before dispatch. 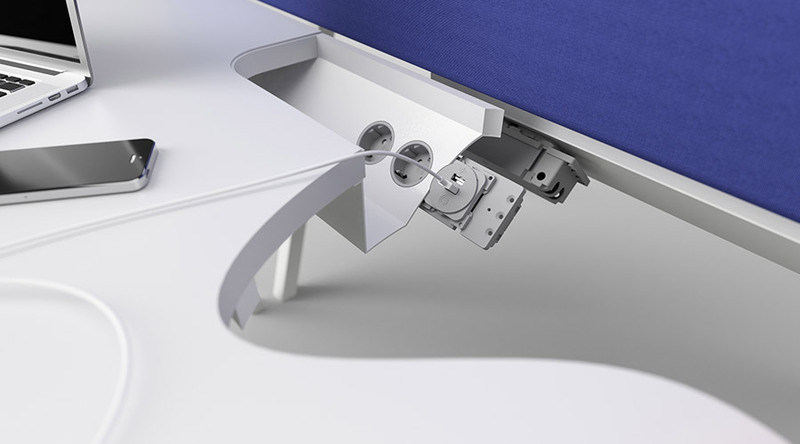 PUMA is designed in panels, whether the panel is a desk screen modesty panel or even the side of an armchair, PUMA can easily be snapped or screwed into place. 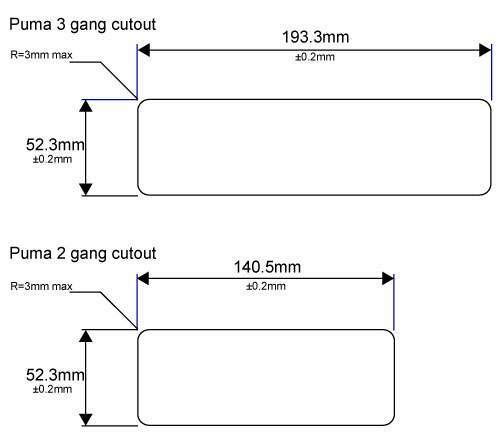 With a panel of between 1.45 and 3mm PUMA can simply be snapped into place with it’s unique clips. 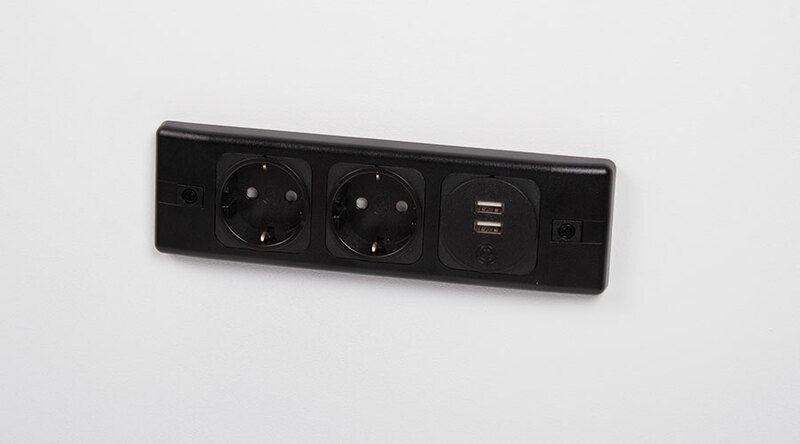 If the panel is thicker than 3mm PUMA can be fixed in place with screws.